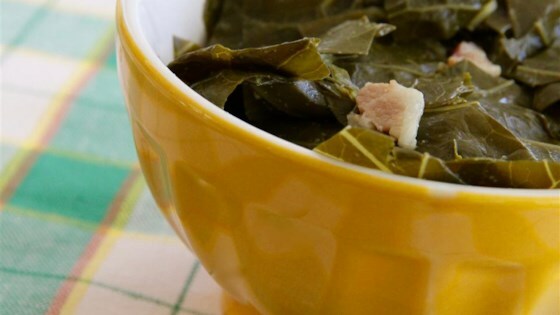 "Easy southern collards the whole family will enjoy. Seasoning measurements are approximated; adjust to preferred taste." Combine collard greens, bacon, salt, garlic powder, onion powder, sugar, and cayenne pepper in a stock pot. Pour enough water over the greens mixture to cover completely. Bring the water to a boil, reduce heat to low, and cook at a simmer until the greens are tender, about 2 hours. I omitted the sugar and added a 1/2 cup of apple cider vinegar at the end. I also added an onion. They were so deliciously fresh and tasty. My 8 year old was raving about these collard greens. I made it! Was so easy and soooo delicious! Every loved them! Made this as specified with fried bacon cut up.Cooked in pressure cooker for 35 minutes and it was wonderful.The bag of pre chopped greens is the way to go. So easy,fast,and delicious. I cooked the collard greens with bacon. It had a little bitter flavor, but I liked it.